Canoeist, Quaker and Computer Person. We just wanted to wish everybody a Happy New Year and say that we did take this week off to spend time with Family but we will be kicking off 2018 on Monday January 8th with Episode 52. 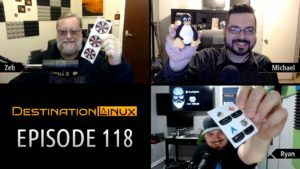 We have some exciting guests lined up for 2018 along with Linux & Gaming news so don’t miss and episode! Thank you to each and every one of you who watch on Youtube or Listen through the audio podcast. Thank you to all of you and Happy New Year!